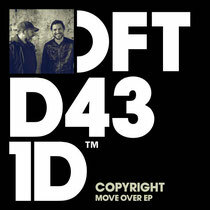 In the midst of spearheading the Defected15 international club tour, UK house duo Copyright return with their new two-track ‘Move Over EP’ on Defected Records. With punchy kick and clap in hand, the title track opens with a foray of crystal crisp hi hats and a series of rhythmic vocal samples. The swooshing risers fly high building momentum for the ethereal synth breaks and eminent dance floor incandescence. ‘Submarine’ pumps a heavier sub kick and sports a pulsing, almost unpredictable synth melody. The smoky female vocals repeat the phrase, ‘And I get so high when I’m around you’, floating behind the knotty bassline and paving the way to the big drop. It’s out 28 July, check it out below.